The poor fruitcake. It’s become a joke, hasn’t it? Well, I was thinking the other day that there’s no reason you couldn’t make a fruitcake that people actually want to eat. I’m not a big fan of candied fruit, so the first step, for me, was to get rid of that. I’ve substituted dried fruit – cranberries, cherries, apricots and golden raisins. 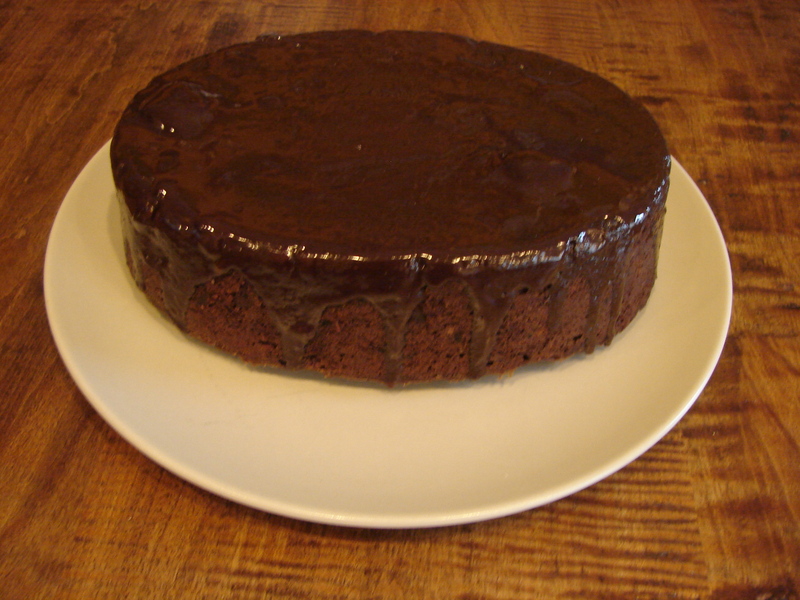 All things that are delicious on their own, and which add a pleasant tartness to the dark, sweet, spicy cake. And then, of course, I added bittersweet chocolate chips. Because everything is better with chocolate chips!! And you know how lots of fruitcakes have brandy sprinkled on at the end? Well, this one has a coating of bittersweet ganache with rum in it. You could bake these in regular cake pans, but for some reason (because I’m crazy!) I wanted them to be more unusual shapes. So I baked one in a casserole dish, and the other in a little straight-sided unusually shaped bowl that my friend Peter made. I wanted to cook them for a long time, because Mrs Beaton cooks her fruitcakes for, like, 3 hours! Mine only took a little over an hour. And if you use regular cake pans they’d probably be done in 1/2 an hour. Cream together the butter, molasses, sugar and vanilla. Add the eggs on at a time. Then add all the dry ingredients. Mix very well. Add the milk – as much as you need to get a stirable batter. Add all of the fruit and the orange and lemon zest. Stir well. Mix in the chocolate chips. Pour into prepared pans (greased, floured, bottom lined with parchment or foil.) 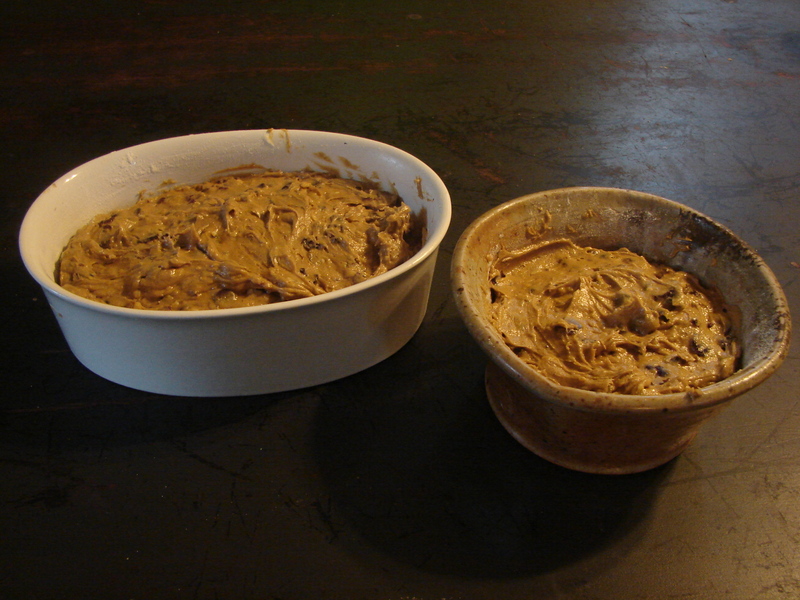 You can use two 8 or 9 inch cake pans, or find some odder shaped ones, as I did. The cooking temp and time will depend on your pans. For regular cake pans go for half an hour (or so) at 350. For deeper pans, go for an hour (or slightly more) at 325, and be prepared to turn the heat down even lower if it’s not all cooked in the center after an hour. Warm the milk till just scalded. Pour it over the chocolate chips, vanilla and rum. Stir until the chips are melted and everything is smooth. Pour it over your cake, coaxing it to run down the sides in pretty rivulets. This entry was posted in cake and tagged apricots & chocolate, chocolate chip fruitcake, dried cherries, dried cranberries, fruitcake with dried fruit by Claire. Bookmark the permalink. I think you’ve just created the cake that will be our Christmas cake. I’m glad to know that other people bake in mixing bowls!! 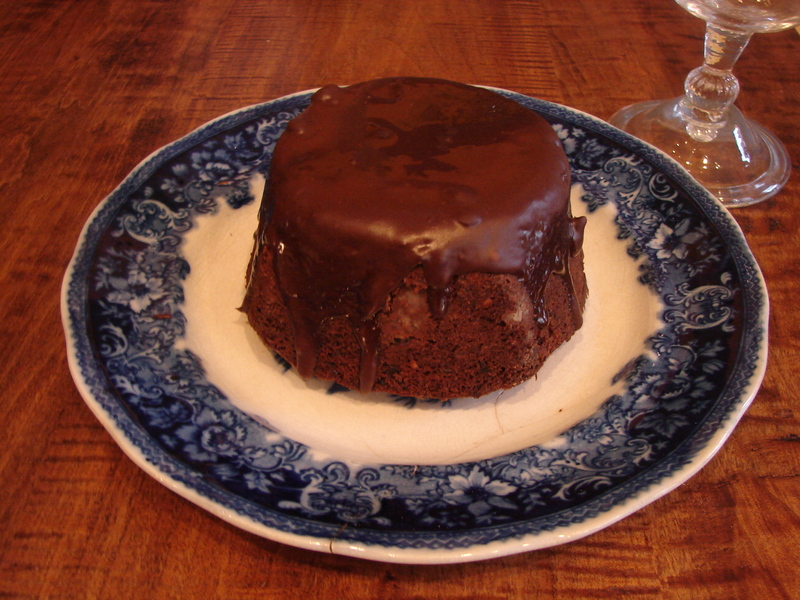 A christmas pudding cake with lots of chocolate sounds good. It’s a good way to get a round shape. My mother started me off when she did a crinoline lady out of a book – since then, I’ve been relatively indiscriminate when it comes to selecting a baking vessel, so long as it’s oven-proof!